Well Pump, Storage Tanks and Water Systems. 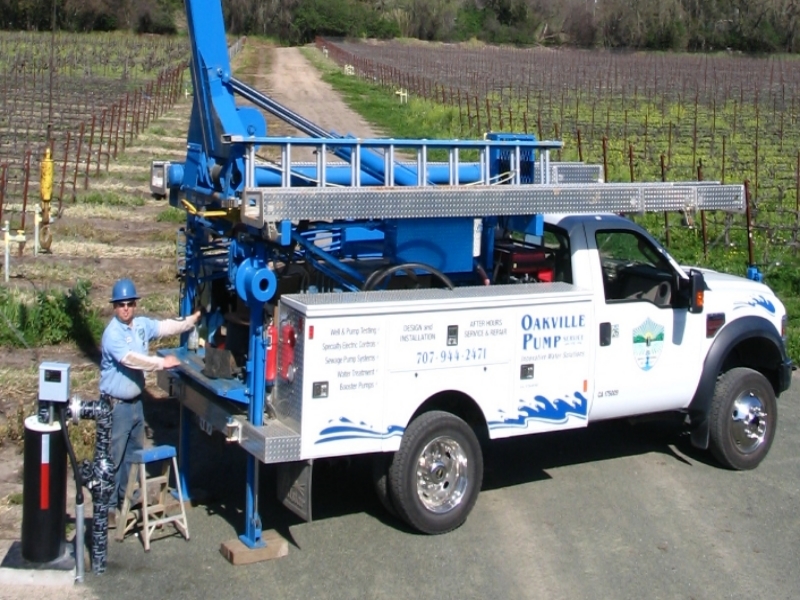 Oakville Pump Service has been the company people rely on in the Napa Valley to keep their water flowing for more than 35 Years. Many home owners call on our services for well pump repair, service and replacement. OPS repairs well pump equipment & installs storage tanks to ensure adequate water supply is maintained during periods of high water demand or when well output is low. In addition, many of our residential clients rely on us to install & service their water filtration equipment; including filters for removing iron, manganese, hardness, taste and odor. We also work with many residential customers that need specialty treatment for their water including Ozone, UltraViolet & Reverse Osmosis. Agriculture and Industry in our community rely on OPS to help provide the equipment and design for their water pump, filtration and treatment facilities. We help wineries provide pure, chlorine free water to meet the requirements of their winemakers. We help vineyard managers water is available for frost protection and irrigation during critical vine development stages. We help facility managers recycle, re-use, manage and monitor every aspect of their available water resource to reduce waste, minimized downtime and maximize system efficiency. Many of our customers are from community or state small water systems that are subject to and must comply with Napa County and State of California regulatory frameworks. OPS has several trained and experience Distribution and Treatment operators that take personal interest in and responsibility for ensuring that each water system they work with is functioning optimally with all the appropriate water tests, maintenance and feedback that the water system owners rely on to guide their water system into the future.